The National Association of Realtors publishes reports for both Pending and Existing Home Sales. The conventional wisdom is that Pending Sales tend to foreshadow Existing Sales to some extent. Precedent suggests that does indeed tend to happen more than 50% of the time. Case in point, Pending Sales leaped from 106.0 at the end of October to 109.3 at the end of November. Then, true to the conventional wisdom, Existing Sales experienced a similar leap last week, moving up to a whopping 5.81 million (annual pace) from 5.48 million previously. The interesting thing is this: as far as relative ranges are concerned, the Existing Home Sales breakout was much bigger than last month's Pending Homes data suggested. 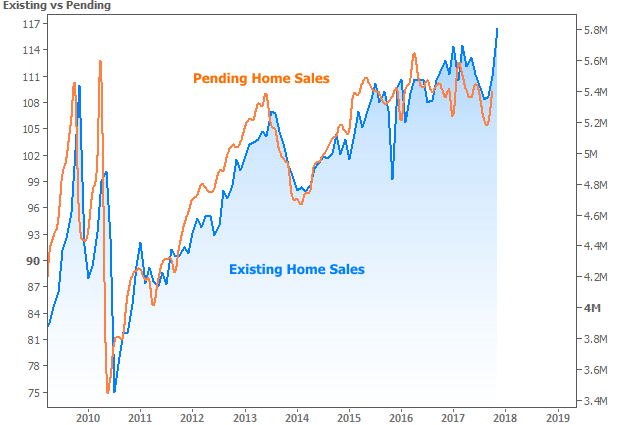 Based on the trendlines I drew in last week's housing newsletter, one might even say Existing Sales are pushing the upper boundary of their trend. If Pending Sales manage to suggest another similar performance is in the works for January, housing metrics could really be on the verge of a shift. Such things seem like too much to hope for given the plodding nature of the housing recovery, so we'll count any chickens that hatch at 10am ET. As far as bond markets are concerned, we should expect much by way of drama and certainly almost nothing by the way of "significance" at this time of year (hence all the focus on the housing-related econ data). That doesn't mean bonds won't move--simply that the movement isn't really meaningful at prevailing volumes and liquidity levels. The day's biggest chance for volatility surrounds the 1pm auction of 5yr Treasury Notes.